Before anyone dismisses the plot of 'Partners In Crime', and it could easily be the case as it languishes in the midst of capers, comedy and CGI, I would suggest it might be worth sparing a thought about the meaning behind Russell T. Davies' rather sly dig at 'Supernanny'. Sarah Lancashire's Miss Foster, a galactic mix of Jo Frost and Mary Poppins, amusingly recalls recent government initiatives to recruit a bunch of "supernannies". He touches on some quite sensitive issues which Blair and Brown were hoping to solve - irresponsible parents and guardians who hire in childcare and the effect of bad parenting on the underclass. The story isn't about the Adipose children being the evil, undisciplined alien monster of the week at all. It's about the underlying problem that parenting is becoming far more difficult in a universe where resources and time are increasingly scarce, where society is becoming ever more selfish (the Adipose pills trade on the superfoods, slimming and diet fixations with obesity), and where childhood is so integrated into economic systems that it becomes the object of enormous commercial pressures (the Adipose break the law to seed other planets and create their brood on the back of vanity and greed). The dilemmas of parenting is notionally the Adipose narrative but Russell T. Davies feeds in other sub-plots. 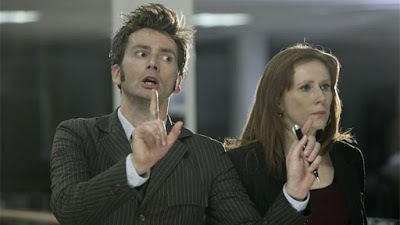 In his supremely amusing re-introduction of Donna, we are treated to two very key scenes about parental relationships. As Donna sits morosely in her mother's kitchen, director James Strong dilates time with a series of striking dissolves as her mother hurls abuse at her about her failed career and social life. This is then balanced by a very heartfelt and warm scene between Donna and her grandfather, Wilf, on his allotment. Wilf is not judgemental at all and offers a wiser outlook on Donna's destiny. Parenting is a tough act and the stakes could not be higher than the responsibility of bringing kids into the world and bringing them up as rounded and worthwhile beings. The Adipose solution is to hire a supernanny...just like Blair and Brown. Donna's solution is to find her destiny with the Doctor much to the glee of her grandfather Wilf. 'Partners In Crime', despite the serious undertones of this message, is a frothy caper, part Spencer Tracey/Katherine Hepburn romantic comedy and part Ealing satire with Tennant and Tate immediately sparking off each other. The gloriously fun opening half where both the Doctor and Donna breach security at Adipose headquarters but still narrowly miss bumping into each other in the open plan office and later in the street is great physical comedy cheekily directed by James Strong and given a springy score by Murray Gold that also has hints of the music for 'The Runaway Bride'. Strong is adept at sweeping camera moves, visions of symmetry and using dissolves. When the Doctor is examining the pendant in the TARDIS, he moves the camera around and up, then dissolves to a wider angle to reinforce that the Doctor is alone, talking to himself in an empty TARDIS. This underscores the lack of an audience identification figure that will later, of course, be filled by Donna. He imbues the episode with a sense of time passing with these sequences and tops it off with that further dissolve of the office clock as Donna hides in the loo. The height of the Doctor/Donna dynamic is the superb encounter across Miss Foster's office whilst she interrogates the journalist. It's fantastically performed,timed and edited and is very funny indeed. The crisply constructed parallel investigations by the Doctor and Donna are expertly extended until the tension is relieved by this sublime visual gag. Their interplay then becomes a series of witty one liners and non-sequiturs that punctuate the episode. Donna's mention of her trip to Egypt 'all guide books and don't drink the water' is both funny and clever in the way it signals Donna's realisation that her wanderlust is far from satisfied and can only be cured by pairing up with the Doctor. She also quite rightly emphasises the changes in the Doctor through her discussions with him about Martha and her observation that this time he isn't intending to kill the Adipose offspring unlike his vengeance on the Racnoss children. It doesn't matter in the end that the animated blobs of fat are just simply that. The CGI is good in some sequences, particularly where they are massing in the streets, but very unrealistically cartoonish in others, especially close up. They function symbolically and are intended as non-threatening which is actually quite a refreshing change and those predicting they may turn nasty were probably a bit disappointed. Many will no doubt find them cute. They're not pivotal to the re-establishment of the Doctor and Donna partnership. The effects for the Adipose nursery are very good, if rather borrowed from 'Close Encounters' and the final sequence of Donna waving from the TARDIS only just about achieves the right effect but looks a bit odd visually. The stunt work and effects on the falling cradle sequence are to be commended though. Tennant and Tate are wonderfully supported by Bernard Cribbins, instantly loveable as Wilf, and Jacqueline King as the waspish Sylvia. Sarah Lancashire finely balances her performance as the villainous Miss Foster and steers it the right side of being a tongue in cheek Bond style adversary. She did remind me a little too much of the equally excellent Samantha Bond in the pilot for 'Sarah Jane Adventures' though. Which is fine as this story would not look out of place in that spin-off series. There is an over reliance here on the use of the sonic screwdriver as a device to solve problems which does irritate and is compounded by Miss Foster also having a similar device. It's convenience to the plot really needs nipping in the bud now and a Doctor who relies more on his wits would make a pleasant change. And then there's that reveal of Rose. A superb hook to keep viewers enticed and completely out of the blue despite being aware that Piper was returning to the series at some point. This is obviously a set up that will pay off much further down the line and it's beautifully and mysteriously established. So, a fun little episode to get the series going. It won't be an award winner and probably won't make the top of the list when the series is over but it's a good start and as with all of Davies' scripts there is always a sub-text to the satire.